Shoulder impingement or subacromial impingement is a very common condition I see in my clinic on a regular basis. The symptoms patients present with is a pain (usually ache, but can be sharp/catching type pain) over the top of the shoulder. The pain is aggravated by moving the shoulder. 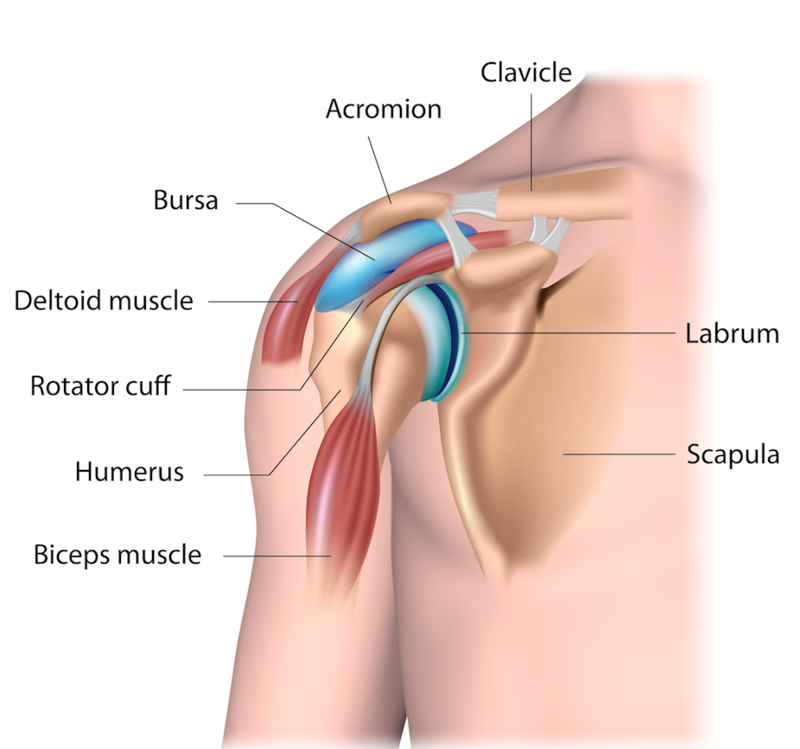 The above image demonstrates the anatomy of the shoulder (looking at it from the front). You will see the space between the acromion (top of the shoulder blade) and humerus (arm bone) we call the subacromial space. In this small gap sits the subacromial bursa. This is a sac full of fluid that is designed to protect the structures around it. Underneath the bursa sits the supraspinatus muscle/tendon (part of the rotator cuff muscles). Some people who present with impingement pain actually have a bony abnormality of the acromion. There are three grades of abnormalities that present as misshaped acromion. They can almost look like the acromion is hooked. This misshaped/hooked acromion can dig into the structures below it (bursa and rotator cuff) causing pain when the arm is moved. It can eventually lead to damage of the rotator cuff and bursa. The role of the rotator cuff muscles is to depress the head of the humerus when the arm is moved, this stops the humeral head from hitting the acromion. However if there is damage to the rotator cuff or it is dysfunctional then it is unable to perform its job correctly therefore allowing the humeral head to hit the acromion when moving. Leading to impingement. The muscles around the shoulder blade can also contribute to shoulder impingement. 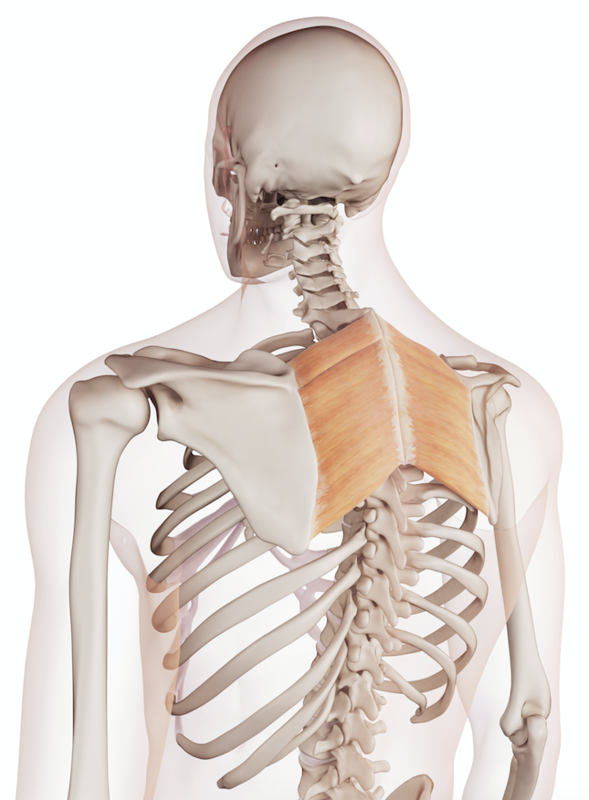 As you can see from the image below the rhomboid muscles (and also the levator scapula) attach onto the inner border of the scapula (shoulder blade) and then to the spine. If these muscles become tight and overactive they can pull the shoulder blade into what we call a downward rotated scapula. If you can visualise the lower tip of the scapula pulled nearer to the spine. This causes the acromion to hit the humeral head. Therefore causing impingement symptoms. We tend to see this pattern with people who have weakness in their lower trapezius muscle possibly caused by poor postures. Treatment for this problem includes muscle imbalance retraining. We would advise strengthening the lower trapezius muscle and scapula setting exercises to position the shoulder blade in optimum position to avoid impingement. Postural exercises to again set the scapula and rotator cuff strengthening exercises. All of these exercises can be found in our shoulder workouts.